In the midst of an evocative panorama of granitic rocks, the columns and pillars of this island sacred to the goddess Isis rise up towards a cloudless sky, creating the impression that one is in one of those landscapes which exist only in the imagination. The temple of Philae has one of the three best preserved Ptolemaic temples, the other two being those of Edfu and Dendera. Following the construction of the old dam on the first cataract in 1904, the temple found itself under water for the greater part of the year and it was only during August that it was visitable because it was only during this period that all the sluice gates were open in order to relieve the pressure due to the flooding of the Nile. 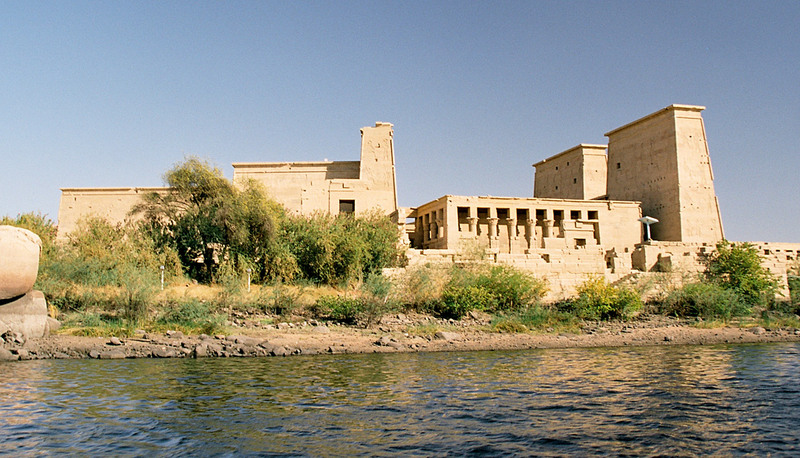 After the construction of the big dam at Aswan it became necessary in order to save the temple, to dismantle it, move it to the island of Egelika, 150 metres to the north, and then put it up again. 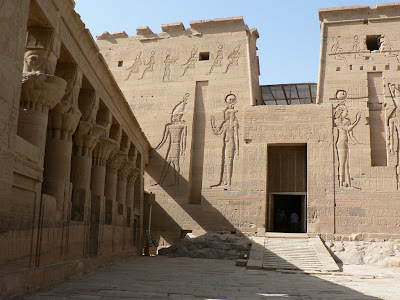 TTie cult of Isis at Philae goes back a very long way and there was a tradition that at least once in his life every Egyptian should go on a pilgrimage to the sacred island. Philae is the smallest of the three islands at the end of the group of rocks which form the first cataract and it is about 400 metres long and 135 metres wide. The southern part of the island is occupied by the complex of monuments which form the sanctuary dedicated to the goddess. It was maintained that the miraculous and beneficial flooding of the Nile each year had its origin there. After Justinian completed the task of evangelizing Nubia, the bishop Teodorus in 535 A.D. converted the temple into a church dedicated to St. Stephen. The southern extremity of the island is occupied by the pavilion of Nectanebo I, a building with fourteen Hathoric columns. This same Pharaoh initiated the construction of the first pylon of the temple of Isis which is decorated at the bottom with the famous scene in which the pharaoh Ptolemy XIII is offering prisoners of war as a sacrifice to Hator and Horus.